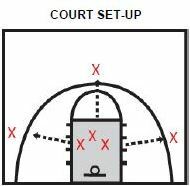 Two drills used by John Calipari. One is to work on your ability to get off a lot of shots and to work on making shots as you get tired. The other drill is to work on your ability to beat your defender and score one on one. You can do this drill with two people, you and a rebounder. If you have a friend or a teammate that you practice with, you can take turns being the rebounder and being the shooter. The three shooting positions are the corners and the top of the key. You shoot from the same spot for 5 minutes. The rebounder must hustle to get the bas1etball back to the shooter as quickly as possible. The goal is to make between 45 and 50 three pointers in five minutes. Depending on your age, you might need to shoot closer in shots and work you way back. Each time you do the drill, keep track of how many you make and how many you shoot so you can chart your improvement. You should get about 70-80 three point shots off in that five minute period. Being able to score or play defense in a one on one scenario is very important to your team. One way to work on those skills is to play one on one in a transition setting. The offense starts with the ball at 3/4 court and the defense starts at the half court line. The offense can attack from either side or in the middle. You should rotate spots as you work on the drill. A point is scored on every possession If the offense scores, he or she gets a point. If the defense gets a stop, he or she gets a point. The key to improving is to go against someone who is close in ability to you or who is better than you. You really won’t improve by playing against players that you are already better than.